Las Vegas casino magnate Sheldon Adelson and Breitbart co-owner Rebekah Mercer are on board. But DeSantis still won't say if he's running for governor. U.S. Rep. Ron DeSantis' campaign is touting an impressive list of billionaire supporters this morning, a week after the congressman was endorsed for governor by President Donald Trump. 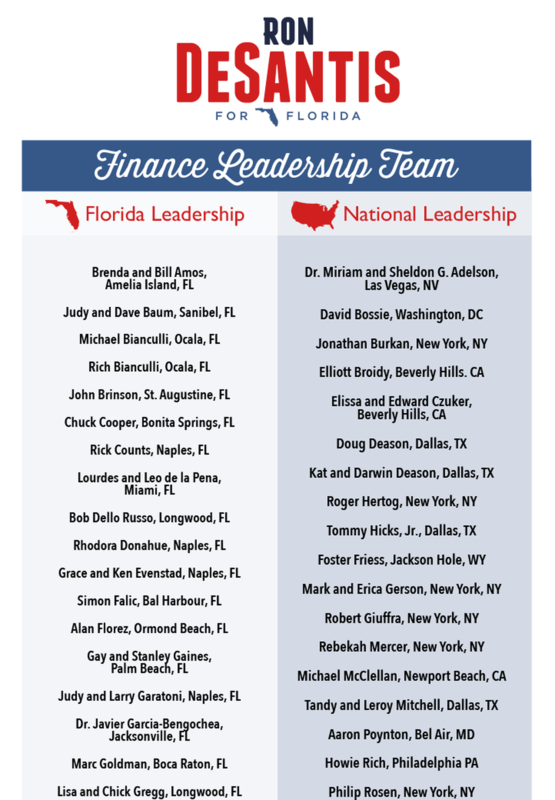 Las Vegas casino magnate Sheldon Adelson, Breitbart co-owner Rebekah Mercer and hedge fund manager John Thaler are now members of his national finance team, according to DeSantis' campaign, although the congressman still has not confirmed he's running for governor. A DeSantis' campaign spokesman said the supporters didn't come on board after Trump tweeted last week that he was a "brilliant young leader" who would "make a GREAT Governor of Florida." "I don't think there's anyone specifically since Trump's endorsement," Brad Herold said. "Some of them have been supporters for years. Some of them have become supporters more recently, as we've been making moves toward the 2018 election." Although there's no official gubernatorial campaign yet, Herold said he is a campaign spokesman because he's getting paid by Ron DeSantis for Florida, a political committee. Herold said DeSantis, R-Palm Coast, would decide soon whether he's running in the heavily contested governor's race next year. Support from those donors would make him immediately competitive, with fundraising not a concern. Several members of the national finance team have strong ties to Trump, including David Bossie, the president of Citizens United and Trump's deputy campaign manager last year. Conservative mega-donor Foster Friess has supported Trump, as has venture capitalist and Trump fundraiser Elliott Broidy. 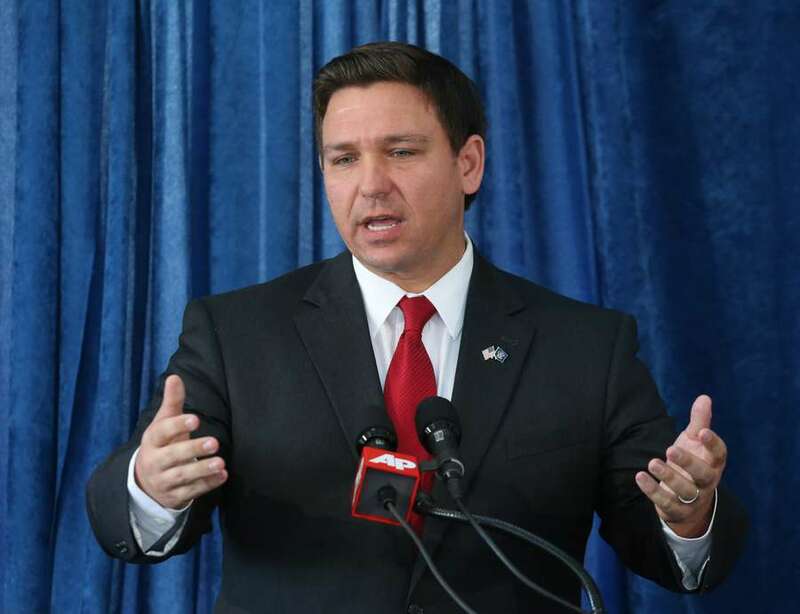 The 39-year-old DeSantis, a former Navy lawyer, is one of several Congressional Floridians who have gained media attention – and Trump's praise – after they attack special counsel Robert Mueller's probe into Russian meddling in the 2016 election. In August, DeSantis proposed an amendment to limit the scope of the investigation, and his criticism has landed him several appearances on Fox News. Trump's endorsement apparently came after seeing DeSantis on the network last week. 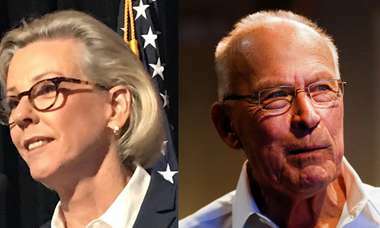 Herold said he doesn't believe the congressman's views on the Mueller investigation "is a factor at all" in gaining the support of the mega-donors. But both DeSantis and others were little-known on the national stage until they took aim at Mueller. U.S. Rep. Matt Gaetz, R-Fort Walton Beach, has made numerous appearances on Fox News and other networks and has warned that the Mueller probe is a potential "coup d'etat." And on Tuesday, U.S. Rep. Francis Rooney made national headlines when he went on MSNBC and called for a "purge" of the FBI.